I heard a car door shut and my coach’s voice, “Sarah, solo es tu y tu camino!” and then it was just me….well, me, my bike and a highway of roaring cars. This was back in November. The last long ride before the Ironman. I stared ahead of me and felt the beating sun on my face. I looked up at the green rolling hills and thought, “This is how I fell in love with Mexico.” And when I looked down at the white line that I was tracking I thought, “Oh hell, this road needs some song!” And assuming that no one could hear me busted out “Somewhere Over the Rainbow” at the top of my lungs. When I was little my grandparents’ house in San Francisco was my magical kingdom: besides being spoiled rotten with sugar cereals for breakfast, jelly donuts on Sundays, two ice cream sundaes for dessert I was also the ever- gorgeous and willing model for my grandmother’s continuous clicking camera. Upon arrival to the castle from Boston, I dropped my bags at the door, and raced up the winding carpeted staircase, where to the immediate left was the king and queen’s bedroom (my grandparents).My grandfather lay in his the big comfy bed with a breakfast tray lying on his belly and the crossword puzzle in his hand. Upon seeing him, I shouted “PAPA!” and he in his gruntling papa way would say, “Eyyyy, Sarahla, good to see ya.” Black and white photos taken and developed my grandma lined the walls with my mom, aunts and uncles, me and all my cousins. But the best part…the real reason that I raced up those stairs so quickly was the Royal Closet. A three part door with mirrors on each one. When you closed the two doors it became a hall of mirrors…I spent hours in there making up songs and plays and conversations with the millions of mes so engrossed in my own imaginary play not giving a care in the world what adult might be laughing hysterically on the other side of that closet. Fast forward twenty-five years, a little more hesitation and reserve has settled in. But on that hot November morning on the roaring highway, after 100 kilometers of riding, I really was not thinking about who might be on the lookout (well, except for maybe that broadway producer who just happened to pass by). At lunch later that afternoon of the bike ride one of my coaches looked at me and said, “So in the car all the sudden I heard, ‘And IIII will always love you.” And everyone busted out laughing. So much for solitude. Another coach reprimanded me not for singing, but for my choice of song. And so began Sarah’s reputation for singing during whatever she does. (to this day, there are certain songs I am not “allowed’ to sing). 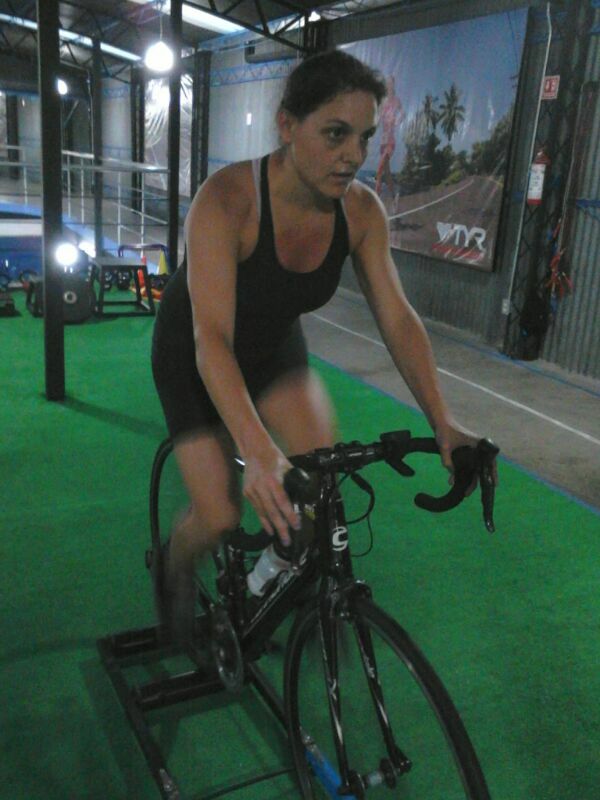 …a bike trainer in which the only way to keep yourself from falling is to breathe, pedal, balance, and relax. The first time I got on, my coach said, “Sing to me.” HA. I couldn’t tell him he was crazy, I couldn’t say anything but whimper and cry out “WOAAAAHHH!! AND DON’T YOU DARE LET GO!” nonetheless, not a single lyric would come out of my mouth. as well of course balance, cadence, and hand position. “What’s that one song that you always sing?” my coach asked me. Oh how the coaches spoil me! Just me and my road, mirrors of myself all around. My choice of song and the echo of my own voice at the top of my lungs (well as much as my breath would allow)…my very own American Idol Diva Moment….all on tape. And I was not about to pass that up. Ladies and gentlemen I present to you… free-rollin to karaoke. This entry was posted in cycling, exercise, Mexico, Training, travel and tagged adventure, biking, coach, cycling, exercise, ironman, karaoke, meditation, Mexico, triathlon, yoga. Bookmark the permalink. This just made me cry. Absolutely LOVE this! Annnnnnd you are not the only who lost themselves in those mirrors-Aunt Cindy, Aunt Hillary, me-and then the next generation you, Zoey-and I bet Emily and Jessica too! I hear Grandma playing Bach, I hear the Beatles in the distance..
OH, and I am so very proud of you too! That bike is something else, but then…you are too!